Why do you think? Three little letters. M.O.B. 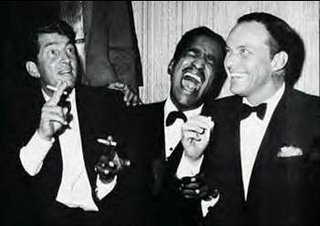 Most of the references on the Web claim that Sinatra did the gig for Sam Giancana, boss of bosses in Chicago from the late `50s to the mid-60s, a friend - if friend is the right word - of Sinatra's since 1958, and the person who Sinatra acted as the front for in his buy into a piece of the action of the Cal/Neva Casino in Lake Tahoe. However, it's more likely that the favor was asked by one of the Fischetti brothers, Rocco, Charlie, and Joe. Charlie Fischetti was the Mob's political fixer in Chicago, and a friend of Sinatra's since the early `40s. Sinatra, nice guy that he was, used to go along with Charlie when he visited his mother in Brooklyn. Charlie died in 1951, but Sinatra and Joe Fischetti were also close friends. He took a trip to Cuba with the brothers in 1946, the so-called "Havana Summit" held by Lucky Luciano, a trip that would haunt Sinatra for the rest of his career. So, Pete Epsteen. What do we know about him? The Sacramento Bee newspaper once published a story entitled, "Palm Springs - Where Stars, Pols - and Mobsters - Live in Style." Although not mentioned in the article, Pete Epsteen was referred to in a photo caption as "an automobile dealer financed by the Mafia." Represented by Sinatra's attorney, Mickey Rudin, Epsteen filed a $6 million libel suit against the newspaper. He denied any affiliation with the Mafia and demanded a retraction. The Sacramento Bee published a story reporting Epsteen's denial but did not retract the charge. According to a Google Search, Epsteen divorced his wife in the `70s, moved to California, and opened a Honda dealership. In 1995 he was prosecuted for his role in a kickback scheme in which dealers in 30 states gave executives of American Honda up to $15 million in cash and gifts in exchange for hot-selling cars and franchises. He was also convicted of perjury in the case, fined $200,000, and sentenced to six months in prison. He died in 1997, in Palm Springs, California. 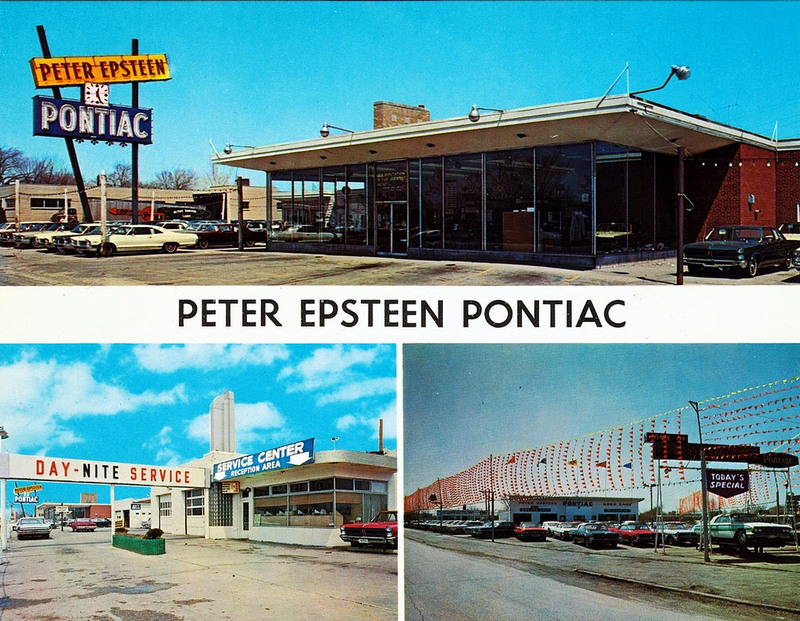 Peter Epsteen Pontiac was the largest-volume Pontiac dealership in the country in the 1960s. You wouldn't have known it looking at the dealership's tiny showroom in Skokie, Ill., a stone's throw north of Chicago. I believe it held just one car. But when it came to throwing a party for unveiling the all-new 1965 Pontiacs, no one could match Epsteen's extravagance and talent for revving up the crowd and selling Pontiacs. The whole rickety dealership franchise system is a dusty marketing vestige of an era when there were 200 American car manufacturers, each eagerly trying to ply their newfangled horseless carriages. In the 1920s storefront after storefront of hawkers of Reos, Packards, Stutz Bearcats, Mercers, Oldmobiles, Fords and the like fought to sell cars. As the dealership system boiled down, it ended up being a cash cow for the con-men left standing who used their government clout to safeguard their privileged market status. No wonder organized crime began to move into the auto dealership game in Chicago during the 50s and 60s. It had a '58 front end mated to a '57 tail. "And it's a special model, too," the car rebuilder insisted. "A Bonneville, or something like that, with fuel injection straight from the factory." He was injured in the Battle of the Bulge and received a Purple Heart and Silver Star for his efforts.